01:43:00 Makes 16 servings, 1 piece (155 g) each. Makes 16 servings, 1 piece (155 g) each. Chocolate cake gets all dressed up! When the occasion calls for an extraordinary dessert, this dramatic-looking chocolate Tuxedo Cake with cream cheese frosting and chocolate glaze is the one to make. Prepare cake batter and bake as directed on package for 2 (9-inch) round cake layers, blending dry pudding mix into batter before pouring into prepared pans. Cool 10 min. Loosen cakes from sides of pan with knife. Invert onto wire racks; gently remove pans. Cool cakes completely. Meanwhile, beat cream cheese, butter and vanilla in large bowl with mixer until blended. Gradually beat in sugar. Cut each cake layer horizontally in half. Stack on plate, spreading 3/4 cup cream cheese frosting between each layer. Spread remaining frosting onto top and side of cake. Microwave Cool Whip and chocolate in microwaveable bowl on HIGH 1-1/2 min., stirring after 1 min. ; stir until chocolate is completely melted and mixture is well blended. Cool 5 min. Pour over cake, letting excess drip down side. 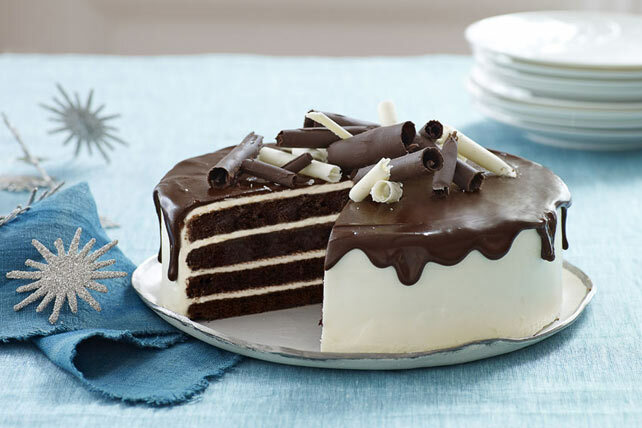 Garnish cake with white and dark chocolate curls. Warm 1 oz. Baker's White Chocolate by microwaving it, unwrapped, on MEDIUM for a few seconds or just until you can smudge the chocolate with your thumb. . Hold the chocolate piece steadily, then draw a vegetable peeler slowly over the flat bottom of the chocolate piece, allowing a thin layer of chocolate to curl as it is peeled off the bottom to make long, delicate curls. Repeat with Baker's Premium 70% Cacao Dark Chocolate. Garnish this stunning cake with Tuxedo Strawberries. Serving Size Makes 16 servings, 1 piece (155 g) each.